Until people just started stealing stuff, British subversion always had an underlying intelligence -- even John Lydon used snarling wit instead of looting, despite spending the 1970s desperately needing new clothes. And really the '80s too. Here to cheekily challenge the old guard with things you put your tea on: Carrie Reichardt. 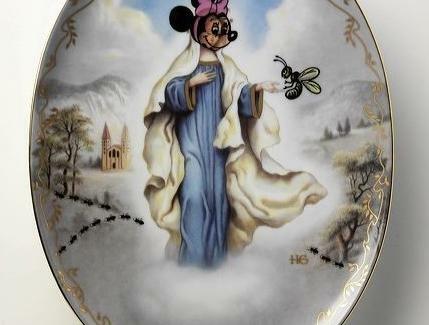 Officially "Baroness Carrie Von Reichardt" (a title apparently passed down from the last Tzar of Russia), this London-based "renegade potter" delights in artfully bending the more rigid elements of the establishment via subtly altered (and occasionally alarmingly prescient) religious iconography & china memorabilia, which much of the establishment considers to be "Hong Kong". Among the regal modifications are Will & Kate mugs given "mutated clown faces", a coronation ribbon plate for George V & Queen Mary w/ their visages turned into skulls, and a similarly treated number with Lady Di & Charles, on which she's also elongated Charles' ears into a simian mockery of...oh. Never mind. Wait, there's more! 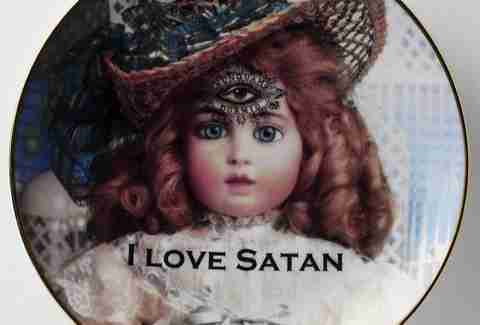 For instance, a Franklin Mint plate depicting a Victorian doll above the phrase "I Love Satan", as well as some alarmingly prophetic items, such as a teacup branded with the Jesus Jones-ing mantra "riot here, riot now", or "Present from Manchester": a gift-shop-esque design with a pair of huge CCTV's covering the Cathedral -- a present to the authorities at least, as those TVs are providing their underlying intelligence.